I'm very eager about Gaim 2.0beta1 and finally i decided to give it a try. You can see my screenshot below, but as far as i see, this beta version has a lot to do before the final version comes out. 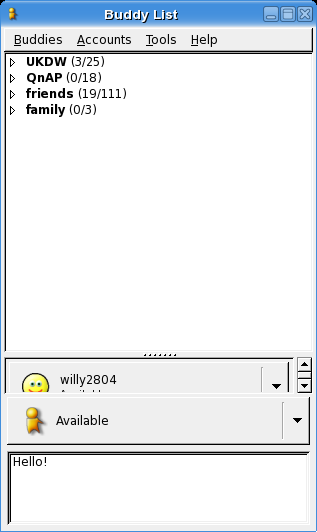 The main GUI for YM is somehow misserable and it is overloading other parts of the window (mostly on the status window. The main options window is now better, just like Mozilla's UI and it's more comfortable to see. All the plugins window has been separated from the options window. I can't wait until the final version comes, but as for now, just enjoy 2.0beta1. Mandriva has released another customized version of the latest Mandriva 2006 which is called "Mandriva-2006-december-club". It has included a new theme, special for winter events, GNOME 2.12 and also the latest version of OOo (i think it's 2.0, not 2.0.1). This version will be available on 6 CDs, just like PowerPack edition and it will contains more than 4300 packages including all the third-party commercial drivers and plugins. Unfortunately, it will not be available for public consumption, only for Mandriva Club's user and it's a comercial services. To get "Mandriva-2006-december-club" - among other benefits - you have to be member of the Mandriva Club. Mandriva Club subscriptions start at 11 euros / 12 USD per month. Since all the 2006 security updates and bug fixes are included, there's no need to reinstall them afterwards. The updated X.org graphics server corrects most of the known issues in Mandriva 2006. Today i went to Semarang with Ivan, Rio, Nico, Jet, and my uncle to buy some foods and toys for Jet. We went to Citraland Mall and we had lunch at Mc Donalds. After that, we went back to Bandungan (it wasn't a nice trip, so i take a nap for some time) and after that, i had to went back to Jogja, because my girlfriend was sick and i had to accompany her.... (it's kindda runaway, but i had a good reason for doing this). I went to the office to fix some bugs that i found this morning and because i still have time, i was working at some exercise which was quite easy and i managed to finish 2 more exercises, so up to now, i have completed 5 out of 8 exercises in module 7. I'll do the rest while i'm in Jogja / Bandungan (but the possibility of having 100% done is very small) and after i came back to Jakarta. I will be on the office again at Thursday, but please don't stop sending your email to me, because i will try to reply it as soon as possible, because i can still reply it while i'm in Jogja (maybe not while i'm in Bandungan). Microsoft team have agreed to adopt Firefox's icon about RSS. They have their own reason, which is to make a standard icon for every users. I think this is a good approach from Microsoft. Let's hope IE don't just agreed about the RSS icon, but also the security approachment being taken by the other browser vendor. I had a nice sleep yesterday after i went back from my office to check my emails (i got approximately 600 emails in my primary emails) and download updates for Slackware. I slept at 7 PM and i woke up this morning at 5 AM (it was more than 8 hours). Unfortunately, the kernel i downloaded yesterday couldn't be installed in my laptop. It always hangs up when starting super server internet daemon (for kernel 2.6.14.3) and it couldn't load a lot of modules (for 2.4.32 version). I'll wait for another release for now and stick with the current version (2.4.31 and 2.6.13 version). For about 8 days, i haven't been able to wrote any blogs and sadly, i lost my digicam also at Jogja. I will be back online starting today until next Friday, as Saturday i will have to come back to Jogja to celebrate christmas at my home with all of my relatives and of course, my girlfriend. Last night, i went to Markas and played pool with some of the bugils (bule gila) from my office. At first, i was pairing with Peter and versus Diana - Ki. We were beaten up 4-1. After that, they played with Mark and Roderick and i switched partner. I tag along with Liza and versus Ronny and Peter. At first, we were beaten 2 - 0, but at the end, we can won 5 - 3. Yesterday was totally not my night. I couldn't focused at all and most of my shots were very inaccurate. Luckily our latest opponents did it also, so we can won. I'll challenge Ki and Diana again at Jogja or perhaps tonight and right now, i'm totally prepared, since yesterday i was quite confused with the training materials (about pointers and structure in C). Although it's a bit late, but i have just found it today (even though i have been searching it for long). The CSS2 Test Suite is now available (it's still in draft and it's not finished). You can try to use your favourite browser to test whether your browser supports many CSS feature as written in W3C standards? We are planning to have some small mini theater today and we will watch some movies together with all the QnAp's personals. We have bought the DVDs and we have prepared all of them (including the foods and drinks), but we haven't decided what we will see since there are a lot of choises around. And finally we decided to watch Chicken Little and The Cave. It was two movies that didn't related at all. One is an animation and the other is some action movie, but both was great. Starting today, i will have C training by Peter van der Kamp and it will be finish at Friday because at Saturday, we are leaving to Jogja to have another training there in Duta Wacana (it's nice to visit my old campus again and meet many people there, as i couldn't meet all people when i came back in my graduation day). There aren't any updates yet for Slackware since the last update for elm. I hope that the development of Slackware still continues, because it is a great distro with simplicity and stability on the top of the priority, which makes it one of the great distro ever being made. KDE 3.5 has been released and no doubt that it includes many improvement from the latest 3.4.3 version. Super Karamba is now included by default and there is a webcam support for MSN and Yahoo account for Kopete. Konqueror has also passed the CSS 2 Acid Test, which is a good news for web developers who liked to experiment with CSS, mostly 2.1 and 3.0. Kicker has also been updated so it gives new visual views. I'm waiting for the next 4.0 release. Today, Mozilla Firefox 1.5 should be released worldwide, but unfortunately, it's Indonesian time, so i should wait tomorrow to get the latest version of Firefox, which includes automatic updates, just like Windows Updates. I can't wait for it, since it will ease me to update the application if there is another update. I don't have to download all the package again, but i just click update and it will be updated. I have fully recovered today and i had to get back to work again after resting for one day. This week, i hope i can finish module 3 and next week, i'll go to Jogja for a training in Kaliurang. Let's hope everything goes smoothly. In PCWorld, there is an article which said that Firefox 1.5 will be released in November 29, which will be next week. I have tried once from Majorgeeks, but it's not the final version. Many extensions were broken after i installed that version. I just found that it wasn't the latest version when they released RC3 few days ago. Let's hope the final version doesn't get delayed again and many extensions gets updated when the final version is available. Freerock GNOME is a complete GNOME Desktop distribution designed and packaged specifically for Slackware Linux. This will help Slackware users who like GNOME desktop, since GNOME was removed by Patrick since 10.2 and they have to install it manually. The latest package is 2.12.1 and now it's available on Linuxpackages.net, so grab them down and install it with pkgtool. I've been looking for a CVS equivalent program in Windows environment, since it is very important tools for development process. Well, i just got some short briefing about SourceSafe, which has the same purpose with CVS or SubVersion. It is very usefull when you are developing some mid to big size project with more than 10 developers, since many people will work on many files and they need to syncronize each other. This kind of tool which helps project manager to manage their codes. Today will be my last day in Jakarta for this week, as i'm leaving for Jogja tommorow because i have a graduation day at Saturday. I'll be back at Sunday and start working again in Monday. Happy graduation day. I am waiting for the new digicam which i bought today. It will be delivered tommorow and i hope there will be no delay, since i will use it in my graduation day. I bought Canon Ixy 50 which has 5.0 MP. Let's hope it has good quality so i can produce nice pictures and screenshots. I'm looking for a good C# Code Optimizer program which can analyze and optimize the C# code which has been made. I have tried ANTS Profiler (14 days trial), but it didn't match my need. Anybody has a program to recommend can give their comments here. Today i continued my Secret of Evermore, but i got stuck when i have to find the diamond eye. I picked up my doggy too fast and i couldn't continue the game. I shouldn't have done it, since i still need my doggy's help on the other room to open up the door. Let's try another way then. Today is supposed to be holidays, but yesterday i have copied my work to my Flash Drive and i intended to do small update on my work, because i didn't have time to work on it at Friday. It was a small fix and i'm trying to conduct a test which depends on higher resolution, but my laptop don't seems to have that capability, so i canceled the test. After we finish our work (fixing bugs and update some modules), we went to BuGil Cafe. BuGil is short for Bule Gila and it's one of most famous cafe in Jakarta for tourists. Many foreigners came there to find some food or drink and to chat with others. We tried to have some pictures there but it's so dark outside, so we didn't get a best result. The food was delicious, but unfortunately i had to wait for some time before my orders came in. I downloaded ZSnes and tried to play my old game in Super Nintendo, such as Secret of Evermore, Secret of Mana, Chrono Trigger, etc. It has a Linux version as well and it worked perfectly, just as same as the Windows version. I found some ROMs in EmuParadise and they were quite small in size (because it's an old platform). Nice jobs for the ZSnes team. Today, the Internet connection was so slow.... until this evening. It is much better now, so i can open up blogger and post this blog. Let's hope it can be finished before the connection become slow again. I don't know why, but i suspect that's because today, most of the office are open again, after Lebaran holiday, so they produces a lot of traffics. Manchester United has won 1 - 0 over Chelsea with a goal from Darren Fletcher. Some people might think that it was a lucky goal (including me), since i don't see any point that Fletcher will aim the ball directly to the net. But who cares about the goal. The match is done and Manchester United has won the big match at Old Trafford. Let's hope this will bring Manchester United back to track. Today there will be a big match in English Premiere League, between Chelsea and Manchester United. Both teams had lost in their last Champion League matches. The big match will be broadcasted at 10.30 PM at TV7 tonight. I hope MU will not lose again, since if they do, it will decrease or probably make their change to grab the title this year vanished. If they win tonight, at least they have stopped Chelsea's run and probably dropped their self confidence, just like what happenned to Arsenal few years ago. They suffered a lot of losses after their unbeaten record was broken by Manchester United by a 2-0 win. My cousin has bought a new game, Age of Empires III and now i'm playing it. It's quite different with the previous version. At first, i played as Morgan, who fought against the Turkish, which is not the real enemy. Soon, the Turkish will be helping Morgan along with Lizzie, a pirates who once Morgan's enemy. It's quite an impressing game, since you can gain many new experience and modify your city, Malta into a modern city. i have no other choises. It's better than doing nothing at my place. Luckily, i haven't seen all the movies. Besides watching DVDs, i also read the comic books which i haven't read (mostly are new one). I will be here until Sunday. Some of our office's staffs were having a BBQ party today at Mark's house. We went there at 4 PM and the party started at 6.30 PM. My friend brought his PS2 also and we played Winning Eleven 9 also. Even though, there were some small accident, it was a fun party and we enjoyed it much. Today, i only worked half a day, doing some testing before we sent our program to the Deutch. We conduct a testing processes and fill the test report plan. After that, we went to Carefour to bought some things that should be bought for the BBQ party tommorrow. Only one day left before i can have my holiday until next week. I have to finish module 1 today and it will be sent for testing. We are conducting our own test procedure today and i hope we can find and fix as much bugs as we can find today. Sunday is the most boring day for my life right now, since there are no activities can be done, so i just wasting time by watching Korean movies, Wonderful Life. It was a great movie, and it was so touchy. I finished 3 DVD yesterday and at night, i went to Citraland with Markus to buy our weekly needs. Yesterday was the worst game i've ever seen since i picked MU as my favourite team. It was strucked 4-0 and they played emotionally. It was like a nightmare. Three goals in first half and it was a simple goal. Let's hope they will be back next week. After a long RC development process, finally the 2.6.14 kernel is released. This version should be released when the last RC was published, but Linus thought that the changes was quite big and it will need some time to test the latest RC, so he decided to put anoter RC before the final release. It's now available on http://www.kernel.org. You can see the changelog to see what has been changed after the last RC. When i logged in into my Friendster account, i noticed that there were some changes made on Friendster's interface. It has a new textbox on the left side of the screen, below your pictures. It's as same as the shoutbox that being used by many people around the world. I never try that new features, but i think it will be great if you can make a services like Shoutbox had. We didn't know that yet, but they have released Shared Source Licenses which had a positive response from open source proponents such as Tim O'Reilly, and even the Free Software Foundation Europe (FSFE). Please read the full details in Newsforge. For several people, finding the best occupation is based on their salary. The bigger the salary, then he will prefer to choose that one rather the other who offer smaller salary. In my opinion, salary is not my first priority, but it should be enjoyed. Not everybody can enjoy their work and they only work just to find bigger and bigger salary. But that doesn't apply to me. I can't work well if i can't enjoy my current job. Of course i should consider looking for a better job that gives bigger salary, but the point is you should enjoy your work first and then work hard. The salary will be raised if you are a good worker and everybody acknowledge your work. I do have great time working in my new office at QnAp Asia. It has a great environment that will support my work. It's only my first month but i had many new experiences here. After two days resting, a new week has come and go back to work again. It will be the last week before we had our vacation together which will be held at 31 October until 4 November. What am i going to do in that day? I don't know yet. We will find out soon. Hey... MySQL 4.1.15 is out now with some huge changes and fixes that can be seen in the changelog. While the 4.1.15 can be enjoyed, the MySQL dev team has prepared for their 4.1.16 release which already contain some bug fixes also. If you lack of bandwidth, then i suggest that you wait for the upcoming 4.1.16 release, as it will contain the previous updates also, but... i don't know when will it be released. For the last one week or probably more, Slackware hasn't been updated yet even though some packages has been updated. I think that it will be released as a bunch of updates. It will be hard for me to download the updates, since the packages are sometimes big enough, like the KDE packages. Let's hope the updates will be released as soon as possible. Finally i finished the image puzzle, with some help from Budi and Markus. Our next task is to integrate all the exercises and also waiting for the others to finish their task. Let's hope we can be ahead schedule which being set to Friday. Today i finished another 3 exercises, so all the exercises has been finished and now, we are concentrating on the database and also the image puzzle that was harder that i thought. I had a headache thinking of this puzzle and it's only module 2 of 11 (or probably more). Starting this week, i will start working on the second modules on my projects. I had 3 exercises and i have finished all the main logic, and tomorrow or the day after it, i only have to review the code, integrate some parts that were still missing today, and make some unit test for those exercises. Let's hope i finish it as soon as possible, so i can help the others to make the exercises. As i said in my previous post, the OOo 2.0 RC3 will be released this week and it is true. The OOo 2.0 RC3 has hit the public mirror and ready to be consumed by the developer, tester, or any other people who are eager to try the new OOo 2.0 build or those who suffered the problem in the RC2 which has been fixed in RC3, mostly for "Incorrect attributes of graphics objects after saving in .odt format". If you lack of bandwidth, i suggest that you wait for the final version which should be finished in one or two weeks. OOo 2.0 final release should be released at 13 October, but due to last minute bugs, the developer decided to postponed the release and working with that bugs and also some minor bugs for Mac platform and some other patches and integrate it to the next RC3 release which should be available at the end of this week or next week. The final release will be a week later, so you can hope it will be released next week, but in worst case, it will be available at the end of this month. Just like any other Open Source project, the final product will not be delivered when it's not ready yet, mostly for OOo, since it will be used by many people and in production phase. I'm looking forward to see the final 2.0 release, even though it won't be too much different with the RC version. Right now, many people likes to use Ubuntu for their distro and it was a famous distro, since it inheritted many of Debian's powerfull tool, like apt-get, so if you need more packages that they provide, you can use Debian's repository. Ubuntu by default uses GNOME as their desktop manager, but if you prefer KDE, you can try Kubuntu, another project which is similar to Ubuntu, but with KDE shipped as their default desktop manager. You can also merge those two distro into one distro by installing the other CD's packages. If you want to use the Ubuntu for education, you should try Edubuntu, ubuntu version for Education. Right now, Ubuntu is finalizing their latest version, 5.10, codename "The Breezy Badger". Just wait for the final release date. Well Well Well... OOo 2.0 RC2 has been released and it has been put on the public mirrors and the official announcement has been updated as well. Go get them from the official download page of OOo or any public mirrors that has OOo's repository. Today i met Doddy, my old friend since we were in elementary school. He had been working in Jakarta for a few months. We went to Taman Anggrek to have a chat and also had launch on Mc Donalds. Most of our friends has been traveling to another city or perhaps country, so it's quite difficult to hang out together. Since i can't use my ISP's SMTP, so i need to change my primary email from willysr@jogja.citra.net.id into willysr@gmail.com. This way, i can receive or send emails from and to everybody. Please note that both emails address are still valid and i always checked them everyday (maybe not in Sunday). Please update your bookmark or address book. Let's get to work, after i received my new laptop, but before that, i have to install some of the development application needed and it's not even started yet, but i hope tommorrow i can start working as a software engineer to finish the project that has been assigned to me. My first night wasn't so good at all. I woke up every few hours, but i thought i had slept for quite a long time. Finally i woke up at 6 AM and read a novel about "The Secret of Shambhala", written by James Redfield. It was his third book after "The Celestine Prophecy" and "The Tenth Insight". It was a good novel that talked about our life and there were some spiritual messages on it. You will learn a lot about our life and also interactions between you and other human beings. Finally i start a new life being home alone. After unpacking all my stuffs, i went to my friend's place and we had dinner together (i have eaten at home, so i didn't eat again). After that, i went back to my place and do some self cleaning before i wrote this blog. Well.. it's a hard life and i had just started it in Jakarta. Tommorrow will be my first day at my new office (i have been there several times though). What's the assignment for me? I don't know yet, but i'm sure it will be great and i can't wait to see it tommorrow. After three years suffering from Bali tragedy, Indonesia once again suffered the same tragedy in the same island, Bali, but in different location (this time in Jimbaran). Today, there were some explosions happened in Bali, which causes some people lost their relatives and friends. Some dead bodies hadn't been identified, but you can check from some local and (perhaps) foreign news. Until 11 PM, there were 17 dead people and some of them are tourists (news from TV7's Stop Press). Polices have found some active bomb and deactivate it, but they will search for more bombs in that area. When will this suffering ends? No one can tell this for sure, but everybody surely wait for it to be happened as soon as possible. We can only pray for that, so let's pray for the true freedom of our nation, Indonesia. Today was like a nightmare on the first experience. First, i have to accompany my mother and sister to shop. It was so boring and finally it was finished after about two hours of shopping (or maybe more). Next, i went to my future living place and they said they only got 1 room left, but i need 2 two rooms for me and my friends. So i postponed the room until i got another one or i should find another place. So, my nightmare continued with my sister and mother were shopping again in Taman Anggrek. It was quite short, since i went to my office and talked with my friends about the previous problems. I got the solutions in about 45 minutes later by getting a new place to stay, but it wasn't empty yet, so i have to call them yesterday morning to confirm it. After finishing my problem, i went back to Taman Anggrek and ... (yes you know the rest). I went back at 8.45 and got home at 9.30 PM. Finally i got a change to write my blog (yes, this is my first good news for today). Thank God i made it. Today i will go to Jakarta at 3 PM and i will be there until next month, when i should come back to Jogja and attend my graduation day at 19 November at UKDW. Well.. that means i will be offline for a few days, until i get an Internet connection. Meanwhile, all email messages sent to be will be saved in my ISP. I will reply them as soon as possible. Slackware has released their first updates after the final release of 10.2. It contains 3 packages, Xorg, Mozilla, and Mozilla Firefox. You can view them in the official changelog. Patrick told me that the Firefox updates were built for 10.0, but i don't know whether it has been modified for 10.2 or not. As an alternative, you can download the Firefox packages available from Linuxpackages, which is build by Jim Simmons. Before i left to Jakarta, i have updated my website on project, aboutme, cv, but mostly regarding to CSS, since it displayed a lot of warnings when i checked it yesterday. Right now, it has been reduced to 3 or less and it is the minimal warnings that i can solve, since it was about background color, and i used an alternate color for some pages for my pages, like the project and guestbook, so if i assign some value, it will make them quite strange. For the last few days, i have started to learn C#, but because i have packed my book and it's on the way to Jakarta, it's quite difficult to learn it quickly. I didn't have the MSDN library CD also, so i depend on ebooks. Most ebook that i got only talked about C# for console apps, but i need C# to develop a window applications. I tried VB's syntax, but it's different also. It's quite an unique language, since it was a fusion of Java and C++, but can be used to develop a window apps also. Last Saturday (Indonesian time, +0700), i have been granted to be an observer at the OOo's Native Lang project and the Indonesian Native Lang project is being set up by the Native Lang Lead, Charles and Louis. We will start the translation project as soon as possible by coordinating our team, preparing the translation of the glossary, and the final task is to translate the POT files for the OOo. We will use OOo 2.0 final release as our base reference, so we still have time to translate the glossary first. I shall make a new mailing list to provide a new communication media for our internal team. I haven't decided a name yet, but if you have suggestion, please send it to willysr (at) gmail (dot) com. Any help will also be thankfully accepted, including resources. People who wishes to see the Indonesian version of OOo can contribute to our project and we are looking forward to see you soon. Uche Ogbuji has written an intersting article about the future of Firefox on XML development. I'm looking forward to see the next major release of Firefox that will deal with XML. I hope they will fulfill their promises to be the best browser in the world. Most of the W3C recommendation has been supported by Firefox and this is a good news for web developers. Let's hope it will continues and getting better. Few days ago i attended the Microsoft .Net Roadshow to Campuss which discussed about .NET platform. I needed an information about .NET because this is the technology being used in my office, so i must learn the basic of .NET. Since i'm also a Linux users, yesterday i downloaded the latest version of Mono, which is an implementation of .NET platform on Linux users. Let's hope the development of Mono keep going and it can reach a stable version with high compatibility level with the real .NET platform. In the last two days, i had my email gets bounced at Yahoogroups. I didn't know why, but when i looked at the messages, it was a hard bounce with a message related to Spamcop or something like that. It's kindda weird. Has someone spoofs my email and sending spam to other people so i got my email banned by the Spamcop? I'm not quite sure, but in case you have a difficult time sending me an email, please send it to willysr (at) gmail (dot) com. The second release candidate version of the next Mandriva release has been shipped in the public mirrors and they contains a lot of bug fixes which can be seen in their changelog. In their release schedule, Mandriva 2006 final should have been released in 15 September, but due to a long delay in the second beta release (it supposed to be released at 30 July but actually was released at 10 August), every schedule was affected by the delay, including the final release, which is now scheduled for 20 August. I hope this version will be better than 2005 release, which dissapointed me badly. It has many simple bugs that shouldn't be there. With Connectiva's technology being merged in this release, i hope Mandriva 2006 will be a good leap for the next 2007 version. Few days ago, i saw a preview release of Windows XP Service Pack 3 on Majorgeeks and it contains more than 180 hotfix for Windows XP. But beware.... It's not an official Service Pack, released by Microsoft Corporation, but it's from thehotfix. If you trust them and you want to make sure that your system is up to date and secure, you might want to try install the patch, but if don't want to take a risk by installing third party patch, you will have to wait for the next SP release, which is unpredictable. The import of the OpenDocument Format is covered by this issue, it is not planned to support also the export in OpenOffice.org 1.1.x. The OpenDocument Format is used as default file format in beta quality builds Openoffice.org 1.9.x.. Except for that filters, this version also fixes most bugs and also port some OOo 2.0 bug fix to this version. For most users, this version doesn't seems to change at all, but it is recommended to upgrade to the latest version, as your application will be more stable, robust, and bug free than your previous version. After a long wait, finally the final version of Slackware 10.2 is out. I will download the ISO images as soon as possible, but my desktop and laptop has been using binaries from slackware-current release, so i don't think i should conduct a major upgrade again. I only need to install the latest package version that was released yesterday, such as xorg and gxine. This version will be using 2.4.31 with 2.6.13 provided in the testing directory along with all latest packages available for now. You should try this version if you are looking for a stable, robust, simple GNU/Linux distribution. OpenOffice.org is proud to announce the immediate availability of the new 1.1.5 version of the award-winning open source office suite. This new version is initially available on the Windows (98/ME/NT/2000/XP), GNU/Linux (X86 and PowerPC) and Solaris (SPARC and X86) platforms. In addition to English, builds for Czech, Danish, French, German, Japanese, Russian, Simplified Chinese, Traditional Chinese and Turkish are immediately available with other localisations following shortly. Standards. XML based, the OpenDocument format enables the free exchange of data between compliant software packages. development and maintenance of the OpenDocument standard, currently comprises Adobe, IBM, Sun Microsystems and numerous other interested parties. The technical committee is open for membership to anyone interested in participating. The OASIS OpenDocument standard has also been specifically endorsed by a number of organisations including the European Commission; Singapore's Ministry of Defense; France's Ministry of Finance and Ministry of Economy, Finance and Industry; Brazil's Ministry of Health; the City of Munich; the Bristol City Council; the City of Vienna; IBM; Israel's Ministry of Finance; Novell; Red Hat as well as Sun Microsystems. The suite, according to the terms of its open source licenses (LGPL & SISSL), is free for all to use, improve, modify, and to redistribute to anyone. The suite and its source code can be downloaded from http://download.openoffice.org/1.1.5/index.html or obtained from one of the CD-ROM distributors listed at http://distribution.openoffice.org/cdrom/. supported, and promoted by an international community of volunteers with its main sponsor and primary contributor being Sun Microsystems. OpenOffice.org operates from . Today i conducted a major upgrades on my Slackware. I upgraded the kernels, glibc, and all the updated packages available from Slackware's Changelog. Upgrading glibc was one process that scared me because i had a bad experience when i was still using Mandrake 9.0. I upgrade the glibc using Mandrake 9.1's glibc version and after that, everything was messed up, so i had to reinstall all the system back. Unfortunately, the upgrade process on Slackware is simpler than Mandriva and i didn't break the system at all. Just type upgradepkg and everything works perfectly, expect for the kernels which need some modifications, mostly on initrd and lilo configurations. In my laptop, the latest kernel, 2.6.13 didn't break with the WLAN modules, so i only need to make a new build for the current kernel and everything was back to normal. I didn't experience any major nor minor problem after upgrading the kernels, but for safety, i keep the previous kernel, 2.6.12.5 on my system, in case something bad happened. This morning i looked at Slackware's Official Changelog and it has a lot of updates, but when i searched the mirrors, they haven't update their repository, even though the changelog has lasted for about 2-3 days long. Just now, it has been updated with the new one. That's a good news. The final release of 10.2 is getting closer. I missed a lot of information while i was in Jakarta, mostly on Saturday and Sunday, because i couldn't get any Internet connection. So i have to be online as soon as possible as i arrove at home and here i am. What a boring day without Internet connection. No forums, no YM, no emails, etc. What i did was writing a list of things that i should prepare when i work in Jakarta. Some of them can be brought from Jogja, while the other must be bought from Jakarta. Maybe i will have a new mobile number to be used in daily activities while i'm in Jakarta, but you may contact me via my old number, because i will keep using it to receive from my old friends. I will let everybody know about my new number via mailing list. Besides that, i also updates my websites locally to fix some bugs and also wrote a new article "Configuring Services on Slackware". I will upload the article and the bug fix on the net as soon as possible when i reached Jogja on Monday. I also update my presentation material about OpenOffice.org Calc. I didn't do a major changes on Writer because i think it's enough for now, so i add a new material on the Calc. Yesterday, i joined the trainning session in my company and everything was fun. We played a puzzle game in a limited time. This game was a simulation to a real project. We had to plan everything, just as we handle the real project. The game was harder than the first game that i played in my first day. In the project, we had to estimate the time, defining milestones, predicting a change plan and redefining resource allocation and task, risks management, and many more. Everytime had to be well prepared, since it involves many factors. I learned a lot of things in 2 days and everything was made just like the real project, so it's like a real work. Too bad i underestimate the project management subject when i was in university. It is an important subject that you can't ignore when you work on a real project. Everything had to be well prepared and that subject will teach you the basic. I went back at 7 PM and i took a taxi to ride my home. After that, i packed my luggage and i had to wait for my sister who picked me up about 2 hours later. I went to my aunt's house and stayed there until next Monday. I'm heading for Jogja in Monday, because i have to finish some unfinished job at Jogja and also preparing many things. I still had to be a speaker at 29 September, where i should bring an OpenOffice.org's material. At 17 and 18 September, it will be my last JEMUAH before i went to Jakarta for my new job. I will be heading back to Jakarta at 2 October and i will start working at 3 October. Yesterday was like a nightmare to me. My plane was delayed for about 45 minutes and it started to take of at 6 PM, where it should be 5.15 PM. After 45 mninutes on the air, i landed in Jakarta and we have to wait about 20 minutes for the airport bus to arrive. It was full, so i didn't get chair to sit and so i sat on the rail that supposed to be a place to place luggages. It's took 1 hour to reach Blok M. Next, we have to wait for our friend who picked us up. Next, we walked to bought a busway tickets. It's my first time to ride a busway in Jakarta. It has air conditioner and i was happy about it, since Jakarta was so hot and my shirt was almost fully wet, because i carried some quite heavy luggage. It also had a nice seat, so it was quite comfortable. Well, i still have time to write my last blog before i go to Jakarta this evening, so i think it will be my last blog post (for temporary only). My friend has an "always on" Internet connection in his place, and maybe i can use his connection to get in touch with everyone around, but still... i can't give you a promise that i can't reply all the email sent to me. Let's hope i get a better place to stay and there's an Internet connection on it. Tomorrow, i will leave to Jakarta and at Thursday, i will have an interview with QnAP's manager. I don't know how long will i stay at Jakarta and until i went back, maybe i'll be offline. (i'll try to find an internet cafe or any internet connection, but i can't guarantee that i can reply all email directed to me, but i'll do my best). My blog will also be stopped for several days. Let's hope i can get Internet connection there. Although Microsoft really put security on their primary focus, flaws keeps comming and now, a new bypass description has been released to break Windows XP SP 2 and Windows 2003. It was first published by Nicolas Falliere in SecurityFocus with a title "A new way to bypass Windows heap protections". He also gives a proof of concept which can be downloaded. I think, Microsoft has to response quickly about this, since there is still time to make a new patch and include it in this months's release, or customers had to wait for another month to get the patch, which is a bad idea. future only be licensed under the LGPL. commercial as well as government environments; nothing has changed. affecting derived products in the same way as the GPL. only under the LGPL, modifications to the source must be published. In the future, perhaps we can write a code by using our own language, thanks to Cornell University and Tel Aviv University researchers who have developed a method for enabling a computer program to scan text in any of a number of languages, including English and Chinese, and autonomously and without previous information infer the underlying rules of grammar. The rules can then be used to generate new and meaningful sentences. The method also works for such data as sheet music or protein sequences. This new algorithm called Automatic Distillation of Structure (ADIOS) and it was successfully identifies complex patterns in raw texts. The algorithm discovers the patterns by repeatedly aligning sentences and looking for overlapping parts. New kernel has arrived for Slackware, 2.6.12.5. It's not the latest kernel version available, because the 2.6.13 has been released officially, but it's the stable one, since 2.6.13 includes many new features and it's considered not a stable one. Maybe after a few minor release, Slackware distro will try to use this version. Most of the functionality in 2.6.12.5 doesn't change from 2.6.12.3, so all my devices are detected and working perfectly. I have swept away the 2.6.12.3 kernel and now i'm using this version along with 2.4.31, although i never boot to my 2.4.x kernel, since most of functionality i needed wasn't available via 2.4.x, like ACPI, Wireless Device, and Touchpad. There is a bug which, depending on configuration, can lead to a heap overflow. If and under which circumstances this is exploitable is unclear to us as of now. We are aware that at least one person was able to write a working exploit on his system using an AVI file with uncompressed PCM audio. We have found a file that is supposed to exploit it but could not make it work, still we do not want to put you at risk by waiting longer to publish this. They have worked a patch on CVS and it can be downloaded. I downloaded the new package from Linuxpackages and it requires a lot of new library, such as divx4linux, libsndfile, libsamplerate, and polyaudio, but i finally managed to install all of them and now it's upgraded to 1.0.7try2. Last Sunday, i wrote about "Where is 1.9.125?". Today, i have found the answer. It's now released under Beta 2 version of OOo 2.0, so you won't find it in developer directory, but in stable directory, where it usually for 1.1.x release. It's not ready for production yet, but if you are curious, you can try this version and give your comments. Recently, i browsed some mirror for an update to OOo 2.0 beta and i found that there has been a directory for 1.9.125, but after i checked few days later (and today), it's still empty and the last update date was 23 August. Where is 1.9.125 build? Well.. perhaps it's delayed and replaced with another build, but who knows? We will see that in a few days later. Jogja LUG will hold another Install Fest in next September along with other events to celebrate the Software Freedom Day. It will be a two day events. The first day will be watching a movie together and also a discussion about GNU/Linux. The second day will be the Install Fest party where you can bring your computer and we will help you to install GNU/Linux on your computer. You can choose which distro will be installed, but we will prepare some of them also. * Removed stuff for automatic print queue setup when starting CUPS. * When printerdrake's first-time dialog appears on plugging a USB printer, the user can now also turn off print queue auto-setup before starting printerdrake and so without needing the printing infrastructure to be installed. * Added automatic setup of Ethernet-connected HP printers with HPLIP. * When one chooses "Printer Connection Type" in the "Edit" menu of an Ethernet-connected printer which is under the control of HPLIP or HPOJ, "LOCAL" was pre-selected as connection type and not "SOCKET". Fixed. * Made matching of detected printer model name with HPLIP database more reliable. * applied patch to cpufreq support centrino. * Set the pwc driver to use non compressed mode by default. Starting last week, the English Premiere League has started a new league session, started by a community shield event that was used for a charity purpose with Arsenal and Chelsea were fighting for the title and won by Chelsea 2-1. MU has won 2 continuous run and this is a good sign that they will be back for the title that was lost to Chelsea last season. Ruud Van Nistelrooy has also scored twice and proven that he was still active and productive. Well.. still 36 more matches and it's a long season. Let's continue to watch the match every weekend. After the release of IE 7.0 Beta 1, the developer start their way to Beta 2 which should include many facility and updates to the latest IE 7.0 development progress, such as CSS enhancement. This is what i need in IE, CSS support. In some websites, there are some reports that said Firefox's is slowing down. Will IE be dominant again after the 7.0 final release? We don't know yet, but as long as security become the open door in IE, people should start migrating their browser to another product, such as Firefox or Opera which are safer and also faster. Few hours ago, i have just seen the latest movie from Steven Spielberg, "War of The World". It was a great combination of thriller, action, and a little bit of horror. Unfortunately, i don't really like the ending, since it wasn't totally finished yet. There are still a lot of tripod-like aliens around in other town and it didn't reflect the war too much. But i have to admin that the effect was great and brilliant. Finally i managed to get the Kevin Mitnick's true story by borrowing the movie that was made based on his true story, Takedown. I know it's an old movie, but it's very hard to search for this movie, and at last i can get it after five years of his freedom day in 2000. Unfortunately, the CD was not in the perfect condition, so some parts are skipping and that's when he cracked his chasser's computer and delete his home directory (yes, it was Linux/Unix's platform). He was trully brilliant and has a high sense of curiosity, like the Nokitel and the SAS technology. He managed to get them both in less than one week by combining Social Engineering, Reverse Engineering, a bunch of Expresso, and also run and hide action. For those who haven't seen this film and you are interested how a hacker/cracker works, you should add this movie to your must-have list. I read KDE 3.5 Preview by Jure Repinc and it was said that the next KDE version will include a new Window Decoration, called Smooth Blend which can be downloaded from KDE-look. It will not be the default and replaced Plastik, but surely it was a great idea, since the new one looks great also. I have tested it in my laptop and it was nice. Why don't you give it a try and give your comments here? For several version, i didn't include the OOo Quick Starter as the installation options, but i should change it and install the OOo Quick Starter as the next OOo build has been released, since it surely reduce the load time of OOo, even though you will have a longer boot time when you enter your desktop environment, since Quick Starter try to load some library needed by the OOo. It's quite fair for me though. Yesterday, UKDWNet held an open house and many new students came into B.1.1 and it was so crowded. Hopefully, many new students will be interested in the UKDWNet for the next generation. The event was part of OKA and every students from every faculty joined the event. It will be held for three days and today will be the last day and starting next week, they will start studying in the new environments. Some online media has published about this article, but i just found it yesterday, after i read PCPlus 235 which was contributed by Y.J. Thurana. He wrote about "Optimizing Firefox Browser" which discuss the about:config preferences which it's documentation can be seen in the MozDev sites. While it is not complete, it is one of the most comprehensive resources available on the Internet, so if you have any addon for this documentation, you can send an email to GuruJ@mbox.com.au. This list applies to Mozilla Suite, Mozilla Firebird, Mozilla Thunderbird, other derivatives and all related extensions! I have updated my articles about Activating Centrino Modules on GNU/Linux. It has been published on PCPlus 235 and i have removed Slackware's path section, since by using the latest hotplug and udev packages, there isn't any modification needed anymore regarding the path problems. If you need an article about installing the Centrino on your laptops, visit my personal page and grab the articles for free. Finally i made up my mind and i have decided that i should register to UGM for MKom master degree. I have registered yesterday but it wasn't complete yet. I haven't submited my photos and my CV (Curicullum Vitae). It should be finished in two days and all i have to do is wait for the announcement. Let's hope in next September i have start my study at master degree. Yesterday i have finished updating the local OOo Documentation Project website by correcting all the HTML tags so it has no warning anymore. It has a lot of pages, so it took me two days to finish that. Now, it is all finished and i'm uploading it right now. If you find any error on any particular page, please give your comments on this post or email me directly. Thanks. I was trying to play Nexuiz, a multiplatform game that was based on Quake Engine. First, i tried this at my Slackware desktop and it was very slow. I realized this because i haven't installed the NVidia driver, so yesterday i booted into text mode and install kernel-source package and the NVidia driver. There was a problem though, which was the miscalculation of the font size. I read the xorg.conf's manual and also the NVidia README (it's a good idea to download the README files), and i added a new field, DisplaySize and entered 260 370 for the value and voilaaaaa...... it was the fix i'm looking for. The game was provided as a bonus for PC World August 2005 Edition. It's full version, so you can play it anytime you like and start shooting the enemy. Right now, i'm starting to search for information about Master Degree Program for my next plan on my study. I have been talking to my lectures to get more information about the university that will suit me. Let's hope that in the next week, everything has been finished, and i should get the answer. Do you need a free online courses? If you do, you can visit Computer Science Course List which listed many basic course. The collection was developed through a U.S. National Science Foundation Education Infrastructure Project in the Department of Computer Science at Virginia Tech. It can also be used to be your inspiration while searching for an idea for your final project. OpenOffice.org 2.0 build 1.9.122 has been released by the OOo development team. It has fixed an installation problem found at the previous version. I have tested in both my laptop and my desktop using Windows XP SP2 and Slackware 10.1. It was great and worked perfectly. I suggest that people who had problems with 1.9.118, should upgrade to this version, since it is the most less buggy version of the next OOo 2.0. You can also view the changes between 1.9.119 and 1.9.122 in their Release Notes. New photo collection has been added to our mailing list's website, which can be accessed via YahooGroups!. Unfortunately, you may have to join to our mailing list first before you can view the photos. Thanks to Mr. Iip Umar Rifai for uploading the files. If you are a web developer and you are having problems with interoperability problems, mainly cross browser code, perhaps you can view Doron's article about Migrate apps from Internet Explorer to Mozilla. He is IBM's Software Engineer Staff and he has worked for Mozilla Project for over five years. This article will mainly discuss about IE and Mozilla, so Opera users will have to try the code used in this article by themselves, but i don't think that as a big obstacles. Mozilla has just launched another update for their Mozilla Application Suite. It was a quick release, since the previous version, 1.7.10 has just been released last week. I am just hoping that Firefox 1.1 will be released as soon as possible, since it's a nightmare to download all packages, even though we only need some small patches, especially for Linux packages, which is usually bigger than Windows's packages. Yesterday i made the final preparation for today's seminar. The seminar will start at 7.30 AM, so please make sure that everyone involved with this seminar come befofe the event started. It is supported by STMIK AKAKOM, PCPlus, Jogja LUG, and Khansa Group. I browse the Internet and found a new magazine that have a subscribtion services. I was suprised that it was so cheap. They offer $1 for each issue. I'm not quite sure whether it's really $1 for each issue. For more information, try to browse the PCMAG website. If you find more information about it, please let me know. Soon after i found that my old CVS account didn't work anymore, i do another checkout to the Mandriva's translation project. This time, i only checkout the Indonesian PO files, not with the POT files. It takes some times, but it's still reasonable. I have to setup CVSROOT again, but luckily, i saved my old tutorials, so it's quite easy to do the same thing again once you experienced with it. In the next few days, i will try to search for information about how to install and configure irda (infrared device) and bluetooth on laptops for Linux platform. I want to make sure every devices on my laptop is working well and enabled. Fow now, all devices is working well, except for infraread, bluetooth, and internal modem. My Wireless device has been working and it can be used instead of internal modem which is somehow will be confusing and hard to install. I have download some packages for irda and bluetooth but i haven't tried it yet. Maybe when i have spare time, i will configure it, since i don't use that devices as much as the wireless devices, so it's not in my high priority list. Yesterday, me, my friend, and my lecturer went to Semarang to search for imported books. We went at 8 AM and got back at 7.30 PM. Unfortunately, the book store wasn't as complete as in the Surabaya, so we only got some books. I bought one book only. Perhaps we will travel to Surabaya, but not this week, because we still have lots of work to be done this week. I was quite dissapointed when i read the news that the release of Mozilla Firefox 1.1 will be delayed, since i'm waiting for it because it will include one facility that i have been waiting for, the Software Update facility. It enables users to download patches only rather than the whole application of Firefox which is approximately 5 MB for Windows and 8 MB for Linux platform. The good news is that new version of Firefox 1.5 will include more facility that it will offer from the previous plans, such as Improved Extension System and Scalable Vector Graphics. The next 1.5 version will be available around September and the beta release will be available around August. Check out their updated roadmap. Meanwhile, the update for Mozilla is available. It skipped 1.7.9 version since it has the same problem with Firefox 1.0.5, so it is named 1.7.10 now. Next week, me and my friend are going to make an extra class for Java programming, with Swing and Applet as the materials. I haven't finished the modules, but let's hope by next week, it will be finished completely, and we can start the extra class smoothly. I used Core Java, written by Marthy Hall as my primary reference and with other reference book, including Indonesian book. It should be ready in the next two or three days. I have to check the exams first, since i have to submit the points tomorrow or the day after tomorrow. I just upgraded my Firefox to 1.0.6 and my OpenOffice.org 2.0 beta to 1.9.118, the latest version available until today and after i run updatedb and reboot, i couldn't even logged in into my KDE with a message similar with "Can't start KDE because don't have any write permission to $HOME". 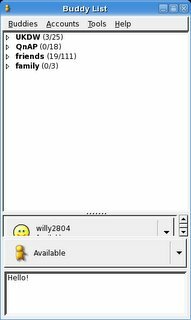 I was suprised and shocked, because i never changed any permission to my home directory, so i rebootted and login into text mode and see the permission for /home/willy and it was owned by root users. So i tried to changed the permission into 777 by giving chmod 777 /home/willy. It worked, but i guess it wasn't a good idea, so i tried to change the owner by using chown -R willy:users /home/willy and also giving read-write permission only for me with chmod 755 /home/willy and reboot again. It also works, so now everything is back to normal. I don't know what is the main problem, but OOo 2.0 installer has a bug when it came in the third phase, which is personal data transfer. It opened a warning that it couldn't open 2 file in the home directory. I suggest for production use, don't upgrade to OOo 1.9.118 for now. It's better to wait for the next release while waiting for further investigation. Another updates comes from OpenOffice.org's development team, which has released OOo 2.0 beta build 1.9.118 which fixes a lot of bugs and also integrates many child workspaces. There are 680 issues found on the latest version of OOo 2.0 build 1.9.118. It's getting better for an OpenSource Office Suite with so many community supports. Had problems with previous version? Try this version and perhaps your problems has been fixed in this version. I upgraded my MySQL into the latest version, MySQL 4.1.12 and it surely changed a lot, especialy in the password column and also the character set being used (now it supports for UTF-8). I have to recompile my PHP so that it will include mbstring extension, needed by the phpMyAdmin and also MySQL. At first, i was faced with so many errors, including a miss type parameter for including mbstring in the PHP's configure script. Luckily, the PHP Developer Team helped me by giving me the correct syntax. Finally, i made it and now it's working normally again just like when i use MySQL 4.0.24. In 16 of July, the whole world was waiting for the time when Harry Potter, Half Blood Prince was released simultaneously, but in Indonesia, people are waiting for the Indonesian edition, that should be released in about 6 month (probably more). I just came from book store and saw that there was still a lot of that novel in the rack, without being touched, since it was in English. I'd like to buy that, but since i have also followed the Indonesian version since the first edition, so i didn't buy it now and will wait for the Indonesian version. After i downloaded the latest kernel version for Slackware, kernel 2.6.12.2 and some other packages, i installed it and somehow, the IPW2200 Centrino driver for my Centrino didn't work anymore. I have tried to reinstall it but still it didn't work. So i have to reboot and use the previous kernel version and found the answer that there are some problems when we use kernel 2.6.12. The solution was to upgrade the IPW2200 driver to the latest version, 1.0.6 which fix this bug and it did work. fixes would be appreciated. For now, rc.udev will be off by default. n/tcpdump-3.9.3-i486-1.tgz: Upgraded to libpcap-0.9.3 and tcpdump-3.9.3. go into an infinate loop, effectively disabling network monitoring. prevents it from loading and breaks direct rendering for these cards. xap/xscreensaver-4.22-i486-2.tgz: Fixed location of man pages. addition to providing many other bugfixes and enhancements. Upgraded to Linux 2.6.12.2 generic kernel (added loopback). Upgraded to Linux 2.6.12.2 kernel headers. Upgraded to Linux 2.6.12.2 kernel modules. Upgraded to Linux 2.6.12.2 kernel sources. bootdisks/*: Regenerated bootdisks with "Slackware 10.2" label. * Code execution via "Set as Wallpaper"